Though mangrove forests are in many ways adaptable ecosystems, they are highly vulnerable to oil toxicity and can be further damaged by many types of cleanup activities. This report summarizes current research on mangrove ecosystems and was written for those who work in spill response and planning in regions where mangrove ecosystems are an important part of the coastline. It aims to help minimize environmental impacts in mangroves when oil spills threaten them. Download the Report: Oil Spills in Mangroves: Planning and Response Considerations [PDF, 2.9 MB]. Originally published in 2002, this report was updated in 2014 to include: lessons learned from spills that have occurred since its original publication, and new global and continental U.S. mangrove distribution maps reflecting the expansion of mangroves in the U.S. as a result of climate change. 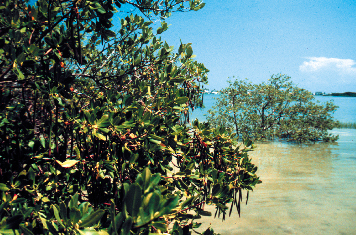 It contains more photos of different life stages of common mangroves in the U.S., response options, and restoration methods, as well as additional graphics showing mangrove ecotypes and oil spill effects on mangrove forests. Order a Printed Copy: Contact our Photos and Orders Specialist by email or by phone (206.526.6558) to inquire about obtaining a printed copy of this publication. By understanding the basics of the ecology of these forests and learning from past oil spills in mangroves, we can better plan for, protect, and respond to spills that may threaten them. Mangroves often border coastlines where coral reefs live offshore, and these two ecosystems are closely linked. Mangroves filter and trap excess sediment that could harm coral, and coral reefs protect shorelines where mangroves grow from excessive wave energy. Both habitats can be adversely impacted by oil spills, and spill responders must often consider tradeoffs between land-based and offshore resources during a response. Find out more about oil spills and other threats to coral reefs. In December 2014, a NOAA biologist helped assess the impact of an oil spill on mangroves in the Sundarbans region of Bangladesh. NOAA was part of a United Nations team assisting the Government of Bangladesh in the wake of an oil tanker spilling more than 85,000 gallons of heavy oil in a UNESCO World Heritage site and dolphin sanctuary. You may also want to learn about the Vesta Bella, which sank on March 6, 1991 about 30 miles southeast of Barbuda, Trinidad, oiling beaches and mangroves on the island of St. John (U.S. Virgin Islands) and ultimately, Puerto Rico. The 1994 report, Recovery of Mangrove Habitats at the Vesta Bella Oil Spill Site [PDF, 3.5 MB], describes the spill cleanup on St. John and OR&R's April 1992 revisit of the island to (1) identify and characterize trends in oil weathering and (2) to determine if wiping mangrove roots was an effective cleanup method.